PROPERTY developer Magna Prima Bhd has launched its latest residential and commercial project, U1 Shah Alam, with a gross development value of RM135 million. The project, targeted at young urban executives, is located in Section U1, Shah Alam, and comprises twin 16-floor apartment towers and a 15-floor office tower. Magna Prima’s executive director and chief executive officer Lim Ching Choy said the residential units in Block A were already sold out. Those Block B are now opened for sale. “The take-up rate is good,” Lim told reporters after the launch of the U1 Shah Alam project today. The apartment block corridors are designed as bridges to induce daylight penetration and increase natural ventilation for energy-saving and environmental purposes, he said. It also has facilities such as gymnasium, sauna, 24-hour security car park, children playground, childcare centre, multi-purpose hall, cafeteria and convenience shop. U1 Shah ALam is located at the intersection of the Federal Highway with the North-South Expressway and the Batu Tiga Puchong bypass. The 15-floor office tower will house 53 first-of-its-kind small office-home office (SOHO) suites that come with club and office facilities, Lim said. It is expected to be launched next month and prices are above RM350,000 for each unit, he said. Among the facilities are gymnasium, jacuzzi, barbeque area, conference room, reflexology path and landscape garden as well as free WiFi access. On future developments, Lim said Magna Prima is looking at launching a new lifestyle project with a five-in-one concept consisting of lifestyle shops, signature offices and service apartments in Jalan Kuching, Kuala Lumpur. The project is expected to be launched in July this year, he said. SABAH'S largest property developer Hap Seng Consolidated Bhd plans to build and buy more commercial buildings in the Klang Valley to expand its property development and investment portfolio. It is looking for strategic locations to build new structures as well as buy buildings that can be retrofitted with modern designs, said chief executive of its property division, Datuk Paul Ng Kee Seng. "Our priority to own and construct buildings is in Kuala Lumpur, but they must be good investments. We also have plans to buy other (existing) buildings and refurbish them, adopting the same concept that we have with Menara Hap Seng," Ng said at the media preview of The Podium. The company bought its first major property - Menara Hap Seng (previously known as MUI Plaza) and two adjoining parcels of land within Kuala Lumpur's Golden Triangle from MUI Properties Bhd for RM190 million cash in 2004. The Podium is a unique three-storey lifestyle commercial centre, which is part of the newly refurbished 21-floor Menara Hap Seng, located on Jalan P. Ramlee. It has a modern chic and contemporary grand office lobby and 80,000 sq ft of net lettable space where RM30 million was spent to give it an uplift from the earlier design. Ng said 65 per cent of the floor space has been taken up by tenants, comprising eateries, retail outlets, banks and specialty stores. 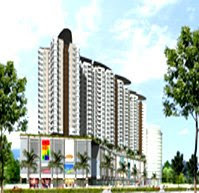 It expects to achieve 100 per cent occupancy by year-end. "We are leasing the units in the Podium for RM5 per sq ft to RM20 per sq ft, while for the office tower, which is 99 per cent occupied, the units have been rented out at RM6 per sq ft. The rate is cheap considering that it is a Grade A commercial building," Ng said. "We expect minimal contribution this year since most of the tenants are still moving in. The bulk would flow in from next year," he added. For the fiscal year ended January 31 2008, the group's net profit jumped eight-fold to RM809.9 million while revenue was up 29 per cent to RM2.24 billion. "Visitors and tenants can look forward to the opening of more outlets and new facilities, including a full-fledged auditorium and seminar centre soon. In all, we hope to establish an ideal place for people to meet and network," Ng said. KUALA LUMPUR: Hap Seng Land Sdn Bhd, a wholly owned unit of Hap Seng Consolidated Bhd, intends to challenge the notion that “office buildings are boring”. Chief executive Datuk Paul Ng Kee Seng said the newly refurbished Menara Hap Seng, previously known as MUI Plaza, offered more than just office space. The hallmark of the office tower is the Podium, a three-level block created as a grand lobby. The Podium has an executive lounge, cafes, restaurants, banks and specialty stores as well as a landscaped garden overseeing the city. Soon, tenants and guests will get to enjoy valet and concierge services. There is also an auditorium and seminar centre with a combined capacity of 220 people available for conferences and meetings. The office tower was 99% occupied while the occupancy rate of the 80,000-sq-ft Podium was 65%, Ng said at a press preview of the building yesterday. “We're confident of seeing full occupancy at the Podium by year-end,” he said, adding that space rental was from RM5 to RM20 per sq ft, depending on the location. The company intends to attract visitors to Menara Hap Seng over the weekends by organising events like flea markets, musical presentations, fashion shows and singing competitions. Hap Seng Land has spent some RM60mil to refurbish the office building, which it bought in 2004. Ng said the commercial building was likely to contribute significantly to the group's earnings by fiscal year ending Jan 31, 2010. Following the success of refurbishing Menara Hap Seng, the company might use some of the concepts in other properties, he added. MALAYSIA has moved fast towards liberalising the steel and cement industries, which supply the main components for construction, says International Trade and Industry Minister Tan Sri Muhyiddin Mohd Yassin. "The steel and cement industries have been progressively liberalised and further deregulation is expected for the steel market in the next few days with regard to prices and import-export restriction," he told a media briefing after launching Metaltech Malaysia 2008 in Kuala Lumpur yesterday. "For the cement sector, we will gradually move into the Automatic Price Mechanism where the price of cement is determined by the demand and supply," he added. Prime Minister Datuk Seri Abdullah Ahmad Badawi is expected to announce measures to combat inflationary trend in the market, which would include building materials. "Only in certain sectors will there be a need for government intervention like the food sector. Other areas such as manufacturing will be more open to market forces," said Muhyiddin. Trade-Link Exhibition Services Sdn Bhd chairman Datuk Zainal Abidin Ahmad said industry players are hoping for a free market equilibrium. The manufacturing industry, identified as one of the key growth areas for the economy, is also facing challenges in the form of high cost of steel imports with the imposition of tax as well as difficulties in sourcing for adequate supply of steel bars of certain sizes. The Domestic Trade and Consumer Affairs Ministry raised the ceiling price for steel bars and billets by 20 per cent in April last year. The disparity between government-controlled prices and the international prices, Zainal said, has resulted in some millers preferring to export their supply. Earlier, in his address, Muhyiddin said Malaysia needs to establish itself as an ideal location for outsourcing. "The engineering supporting industry in Malaysia is internationally recognised for the quality of products and services and has the capability to support the machinery and equipment (M&E) industries," he said. The government is encouraging local engineering supporting companies to position themselves to become total solutions providers, offering integrated services from production conception to serial production. Meanwhile, the Malaysian Industrial Development Authority (Mida) has arranged business matching meetings for the outsourcing requirements of companies from France, Denmark, Italy, the United Arab Emirates and Singapore in conjunction with Metaltech Malaysia 2008. With more than 1,500 exhibiting companies, the five-day event is expected to attract 25,000 trade visitors from around the region. Mida is also holding a two-day national seminar on business opportunities in the M&E industries. Housing and Local Government Minister Datuk Seri Ong Ka Chuan (2nd left), PAM president Lee Chor Wah (2nd right), Architect Centre general manager Hussein Hamzah (left) and Archicentre Ltd (Australia) chief executive officer Robert Caulfield (right) at the launch. KUALA LUMPUR: Every piece of property should be inspected every five years, said Malaysian Institute of Architects immediate past president Dr Tan Loke Mun. “Just like a car has to undergo regular servicing to make sure it is in working order, homes too need to be maintained and have the necessary repairs carried out regularly,” he said. “There are also buildings in Malaysia which were built in the 1960s, and most building materials have a lifespan of around 20 to 30 years, so things will start to break down if they are not checked,” he said at the launch of the Architect Centre Sdn Bhd here yesterday. Housing and Local Government Minister Datuk Seri Ong Ka Chuan, who launched the centre, said the ministry had received between 2,400 and 4,500 complaints a year over the last five years. “In 2005 alone, there were 356 complaints of defective work, while the figures for 2006 and 2007 were 238 and 192 respectively. “While there appears to be a downtrend which augurs well for the industry, the figure should be kept at a lower level,” he said, adding that most of the complaints were on wall cracks, roof leaks, plumbing problems, poor plaster and paint work, and ground settlement. The centre aims to have a standardised system of inspection of new and existing buildings, especially with regards to defects, appraisal of quality of workmanship and dissemination of advice to rectify such defects. “We only do visual inspections. If there are any serious structural problems, we will advise the house owner to engage an engineer to solve the problem. Inspection services start from RM500 for smaller low-cost housing,” said PAM president Lee Chor Wah, who was also at the event. For more information on the centre, go to www.architectcentre.com.my. “I urge these housebuyers to be patient. We are already trying to get another developer to salvage the project,” he said. The report said that the 2,000 housebuyers in Puchong had waited for more than three years for their homes, some of which were supposed to have been completed in 2003. INVESTORS sold down shares of some of Malaysia's biggest highway concessionaires yesterday, on concerns that profits would be hurt if the government lowered toll rates. Analysts said this was in knee-jerk reaction to Works Minister Datuk Mohd Zin Mohamed's comments on Wednesday that the government would review all highway concessions in a bid to reduce toll charges. Shares of PLUS Expressways Bhd, which holds the North South Expressway concession among others, fell by 3.7 per cent to close at RM3.10, its biggest single-day drop in seven weeks. Shares of Lingkaran Trans Kota Holdings Bhd (Litrak), which owns the Lebuhraya Damansara-Puchong (LDP) toll concession for up to 2031, fell by 5.2 per cent to RM3.82 during the day. It, however, recovered to close at RM3.82, two sen higher than on Wednesday's closing. "People are worried the government will force the concessionaires to lower the toll rates. But we don't think it's going to be possible to do this as the agreements are all in black and white," said Kamarulzaman Hassan, an analyst at TA Securities. Lower toll rates are "a far fetched idea" unless the government is willing to compensate the concessionaires, he said. He is maintaining his "buy" recommendation on both PLUS and Litrak. Litrak, nevertheless, said it was concerned by the latest development. "We are concerned, but our negotiations with the government have always been fair in the past and I don't see why it shouldn't continue to be so," a company official told Business Times. He said the LDP's next scheduled toll hike is not till 2010, when rates are meant to go up to RM2.10 from RM1.60 now. Litrak was to have raised its rates in January 2007 but the government did not allow this and had to compensate the company, as per the concession agreement. Litrak was compensated partly in cash and partly through an extension in the concession, the official said. Other highway concessionaires fared mixed on the stock market yesterday. IJM rose 40 sen to RM5.90, Gamuda rose 2 sen to RM3.16, MRCB fell 2 sen to RM1.63 and MTD Capital closed unchanged at RM3.28.